Dedicated and passionate child safety advocates, Bruce and Denise Morcombe were named the 2018 Sunshine Coast Australia Day Awards Citizens of the Year at a special ceremony held today (January 23) at The Events Centre, Caloundra. Bruce and Denise suffered every parent's worst nightmare in 2003 when they lost their son Daniel in devastating circumstances and have worked tirelessly since then to help prevent other families from ever having to endure what they went through. As a legacy to Daniel and in honour of his memory, Bruce and Denise founded the Daniel Morcombe Foundation to assist educators and parents in the education of children about their personal safety, assist young victims of crime and empower people to make their local communities safer for children. Mayor Mark Jamieson said this year's Sunshine Coast Australia Day Awards had again highlighted the outstanding work of a number of community-focussed Sunshine Coast citizens and organisations. "Bruce and Denise Morcombe were each nominated as individuals for this award, however the judges had a hard time separating them which resulted in a tie and acknowledgment for them both," Mayor Jamieson said. "The work Bruce and Denise have done for our community, and many other communities across Queensland, has and will continue to help protect our youngest citizens from harm. "Their dedication to promoting child safety is honourable and this award is one way we are able to show our appreciation for their work. "Our nominees in the Australia Day Awards are a very special group of achievers and this is our chance to say thank you. "Their stories and efforts are inspirational and highlight how fortunate we are to have so many everyday heroes walking amongst us. "They fully deserve this public recognition for what they do to make our region a better place." Bruce and Denise are co-founders of the Daniel Morcombe Foundation. The Foundation was established to educate children regarding their personal safety (including abduction) and to assist victims of crime, particularly where crime involves children. 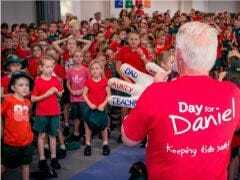 Bruce has presented on child safety to more than 500 schools across Queensland as a Queensland Child Safety Ambassador, created Day for Daniel, helped to develop the Daniel Morcombe Child Safety Curriculum in collaboration with the QLD Department of Education, QLD Police Service and Department of Community Services and personally assisted families of missing persons and created the Walk Tall Program in collaboration with ACT for Kids. Olivia has demonstrated exceptional personal and academic achievements as well as significant community involvement. She represented Australia at the London International Youth Science Forum, studied advanced physics at the Junior Physics Olympiad (2015) and was selected for the Young Scholars Program (2016). Olivia volunteers her time to a project called The Olive Stories that aims to empower youth. She is a keen instrumentalist that volunteers her time to the Vivace String Ensemble. She was named the Public Speaking winner at the Lions Youth of the Year quest. Instrumental in shaping and forging a region, Donald's iconic leadership and community service has afforded him three life memberships with Sunshine Coast Helicopter Rescue Service (now RACQ LifeFlight), Tourism Sunshine Coast (now Visit Sunshine Coast) and the Sunshine Coast Turf Club. Eight years served as Chairman of Tourism Sunshine Coast where tourism increased fourfold. He also chaired the Sunshine Coast Helicopter Rescue Service for 21 years, helping to save more than 42,000 lives. 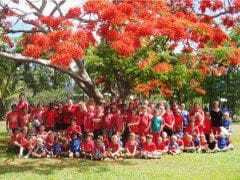 The Daniel Morcombe Foundation was established by parents Bruce and Denise Morcombe in 2005 after the devastating loss of their son Daniel in December 2003. The Foundation was established as a lasting legacy to Daniel and assists educators and parents in the education of children about their personal safety, assists young victims of crime and empowers all Australians to make their own local communities safer places for children. Judy has supported the artists and creative industries of the region through the development of the Old Ambulance Station, a significant cultural resource. Under Judy's voluntary management and the efforts of its board, the organisation has moved from a tactical strategy of activating and animating the space, to a more considered strategic approach to medium and long term development. Judy has managed the day-to-day operations of the facility and dedicated time as secretary of the board. Judy continues to manage Work for the Dole volunteers, who are engaged both operationally and creatively. Through Judy's expert fundraising skills the Old Ambo attracted more than $200,000 in funding for building and business development as well as creative project development and delivery. Australia Zoo Wildlife Warriors aims to involve people in the protection of injured, threatened or endangered wildlife. Through funding conservation projects, research collaboration and educating the wider community, Wildlife Warriors are working towards the protection of wildlife and wild places. The largest project of Wildlife Warriors is the Australia Zoo Wildlife Hospital that treats, rehabilitates and releases sick, injured and displaced native wildlife. The hospital has treated more than 73,200 patients. The hospital team also conduct and support vital research. The club was built with, and for, the local community. To grow from a name and logo to national champion in a matter of months is testament to that community support. Led by CEO, Danielle Smith CA and Head Coach, Noeline Taurua, the club has made a concerted effort to involve the community along the way. The team has done an outstanding job of representing the Sunshine Coast in women's sport, and, in their first year of play, brought home the premiership. They have encouraged young girls to aim for greatness, as well as making Sunshine Coasters proud of what we can achieve.